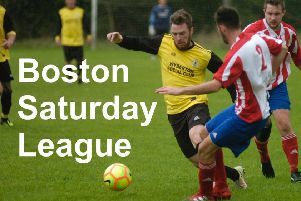 Skegness United returned to action with a 4-1 victory over CGB Humbertherm in the Lincolnshire League. This was United’s first match back since their 5-0 derby defeat to rivals Skegness Town before Christmas, and they showed no signs of a festive hangover. The match was one of the few to survive in the area following the rain of the last few days. United made a number of changes from the previous match with new signing Liam Bull making his first start, after previously playing this season for Wyberton and Holbeach United. Nathan Wetton was making his first start and there was a recall for Alex Kendrick. For the first 15 minutes neither keeper was troubled, although United had the upper hand. However, they could not find the final ball to open up the visitors’ defence. During this period Kendrick was prominent with his runs down the right. On 25 minutes, against the run of play, Travis Portas had to make a couple of saves to prevent Humbertherm taking the lead. Then in the next minute Kendrick went on a run from his own half to the edge of the visitors’ area, but his shot was wide of the target. On 35 minutes Danny Reid picked up the ball on the left and cut in, however, his powerful shot was just over the bar. Then in the next minute the visitors took the lead. Kyle McGuigan slipped on the wet surface and this left Jack Barker with a clear run on goal, the player slipping his effort beyond Portas. From a United corner Jake Portas headed just over the bar. With seconds remaining of the half, Reid broke down the right but his cross flashed across the face of the goal without a United player able to make contact. United went into the interval break one goal down, however they were still well in the game and an early goal after the re-start changed the picture. Reid created a chance for himself when turning his marker in the area, but was wide with his shot. United drew level on 55 minutes with a fine move. The ball was played out to Kendrick, who moved the ball onto Portas who, in turn, found Reid, the striker firing home past keeper Connor Knox. Ten minutes later United took the lead when a through ball was picked up by Reid, who went on to place a hard driven shot past Knox. At this stage it was all United and Nathan Wetton and Kyle Howitt were combining well down the left. Five minutes later United scored number three. Following a corner the ball was fired in from the edge of the area and Knox failed to hold the ball. From close range Bull knocked the ball home to open his account for United. On 80 minutes United went four up when, from another corner, Jake Portas headed home from a couple of yards out. UNITED: T. Portas, J. Portas, Howitt, Simpson, McGuigan, Cunliffe (Paul), Bull, Wetton (Demeter), Hobbins, Kendrick (Wolstenholme), Danny Reid. Men of the match: Alex Kendrick and Jake Portas.